A previous version of this story falsely reported that ARC won its first division game on Saturday. In fact, Saturday’s game was the first league win. Running backs Ce’Von Mitchell-Ford and Armand Shyne starred for American River College’s running game in a 49-31 win over the College of the Siskiyous on Saturday, rushing for two touchdowns each as the team scored five of its six touchdowns on the ground. Mitchell-Ford went for 159 yards on 19 carries, including a 33-yard touchdown in which he barrelled into the Siskiyous defense before breaking free for the score. Shyne had 64 yards on 12 carries, scoring on a 1-yard run early and a 31-yard play later on. 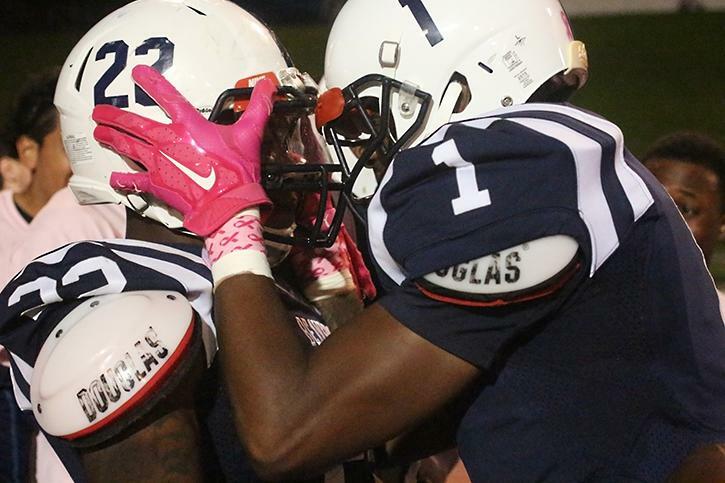 ARC’s running backs coach Michael Morris credited the preparation of his players for their performance on the field. Morris also gave kudos to the offensive line for allowing the backs open lanes to the end zone. ARC quarterback Jihad Vercher finished the game 16 of 29 with 211 yards passing and threw for two touchdowns to receivers Jonathan Lopez and Malik Dumetz. Vercher also had a rushing touchdown, scoring on a 7-yard quarterback keep. ARC dominated the first half, scoring five of its touchdowns and holding a 36-3 lead at the break. 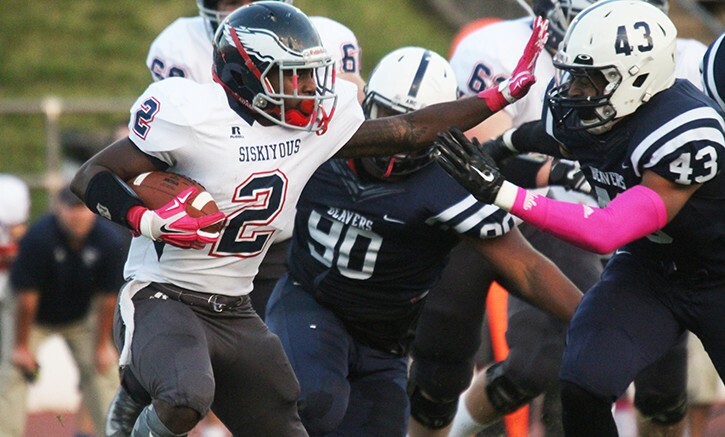 The team scored a touchdown in both the third and fourth quarters, but allowed 28 second half points and at one point let Siskiyous cut its deficit to as little as 11. Head coach Jon Osterhout praised the team in his postgame speech for getting a win in its first league game, but stressed the importance of maintaining a certain focus level from kickoff until the final play. Osterhout said that about 80 percent of the players seem to be in the right mindset and the other 20 percent need to catch up. Vercher agreed with the assessment of his coaches. Vercher added that the gap being closed was the result of poor offensive execution, not the defense being fatigued. The team previously had trouble in a win against San Joaquin Delta College on Sept. 19 of not allowing the opposition back in the game before scoring late to put it out of reach. “It’s a game of momentum and if we learn to finish, we’ll have a dynamite football team the rest of the year,” Osterhout said. The team’s next game is Saturday at Feather River College in Quincy, California. Osterhout said the long ride won’t affect the team. “We’re not worried,” he said. “If we got to drive to Florida, we’ll drive to Florida. Be the first to comment on "ARC football wins first league game"